Good mowing practice helps protect the investment you've made establishing a lawn. Choose the right time to mow. Mower blades must be set so only the top third of the leaf is cut. Fine-leafed turf like couch can be mown down to 15-30mm high; so if you want it to be 20mm high, mow when the lawn reaches 30mm. 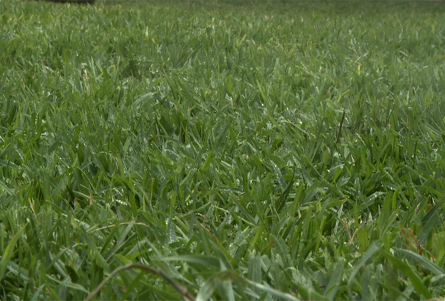 Coarser grasses like buffalo can be mown down to 30-50mm. If you've left the job too long, stick to the "one-third" rule and bring the grass height down in two separate cuts. 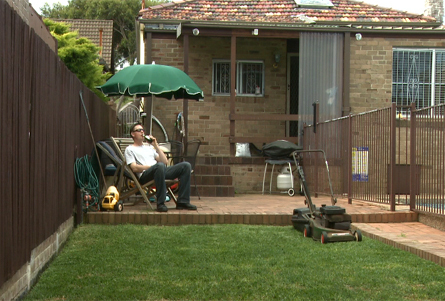 Both you and the lawn will suffer less stress if you mow under cool conditions. Avoid mowing wet or dewy grass: it creates ragged wounds that are more open to water loss and disease, as well as a heavier catcher and messier job for you. 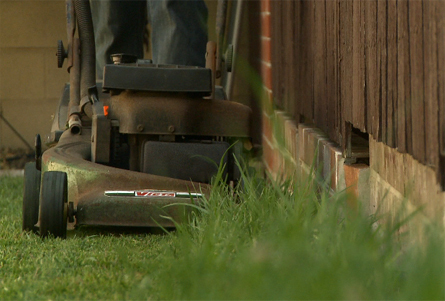 Ensure the mower blades are sharp - again to avoid those rough tears and to produce a crisper looking finish. Walk the lawn and remove anything that shouldn't go through a lawnmower. Wear closed footwear as a minimum and other protective gear as sensible. For an even cut, mow at a steady pace; overlapping each run so they stay consistent across the whole lawn. Keep the grass upright and minimise compaction by changing your route and direction each cut. 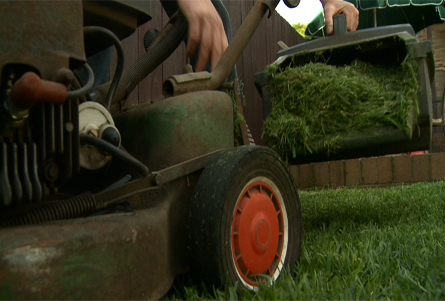 Catch and remove clippings from lawns with a disease or thatch problem. Leaving clippings as mulch - especially when wet - can leave sticky clumps on the lawn and further encourage disease. But otherwise, dry clippings will quickly decompose and can be safely left on the lawn to help retain moisture and nutrient in the soil - and save you the trouble of emptying catchers. Or alternate. This fine organic matter is great for the compost bin but don't pile clippings as a thick mulch straight onto garden beds as they soon pack into a water-resistant barrier. Choose the right time to mow: only the top third of the leaf blade should be cut to avoid stress that can open the lawn to weeds and disease.